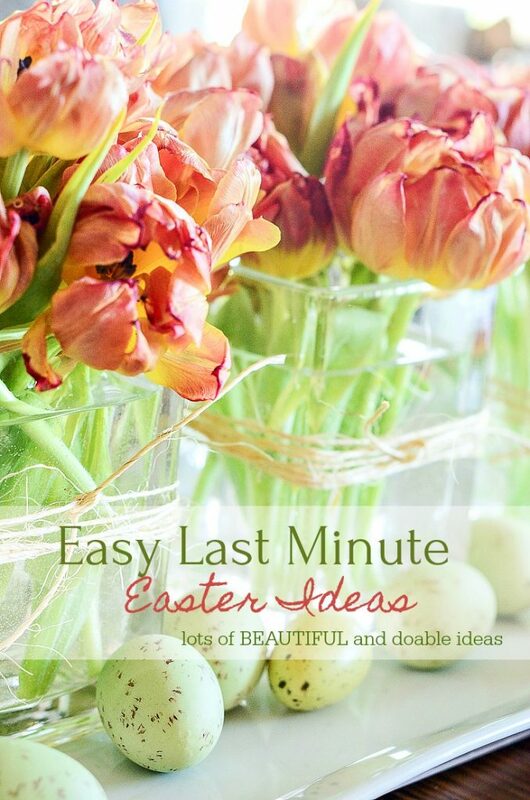 Easter is just around the corner and we all need easy last minute Easter ideas, right? I love decor ideas that are no fuss. So today I’m sharing creative and easy ways to decorate for Easter when you don’t have much time! 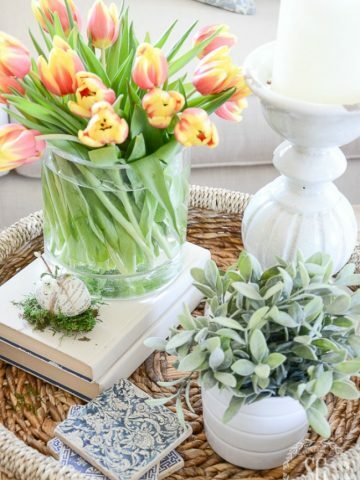 I’m starting with my favorite spring decorating idea first… TULIPS! They are inexpensive, come in lots of pretty colors and offer a big big dose of gorgeous spring to any room they are in! I can keep my tulips for about a week (maybe a little longer) if I buy them as tight unopened buds (yes, buds! I looked it up). 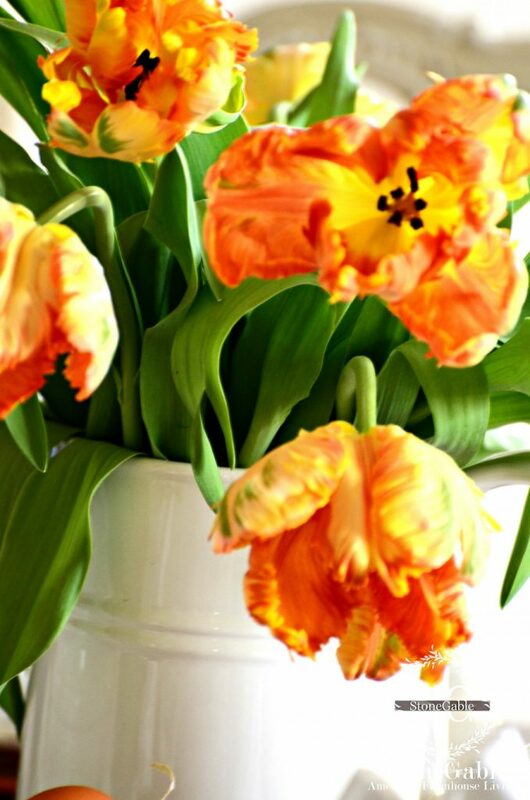 Just follow the simple tips for HOW TO CARE FOR CUT TULIPS SO THEY LAST LONGER. However, don’t use the penny trick unless the penny is old. There is not enough copper in today’s pennies to help tulips. Who knew? Isn’t this the perfect and easy last minute Easter idea? Decorating with tulips makes me so happy! If dying eggs is on your to-do list this Easter why not dye them with yellow onion skins right in the water you boil them in? So easy and the effect is just stunning. Now, that’s what I call an easy last minute Easter idea!!!!! 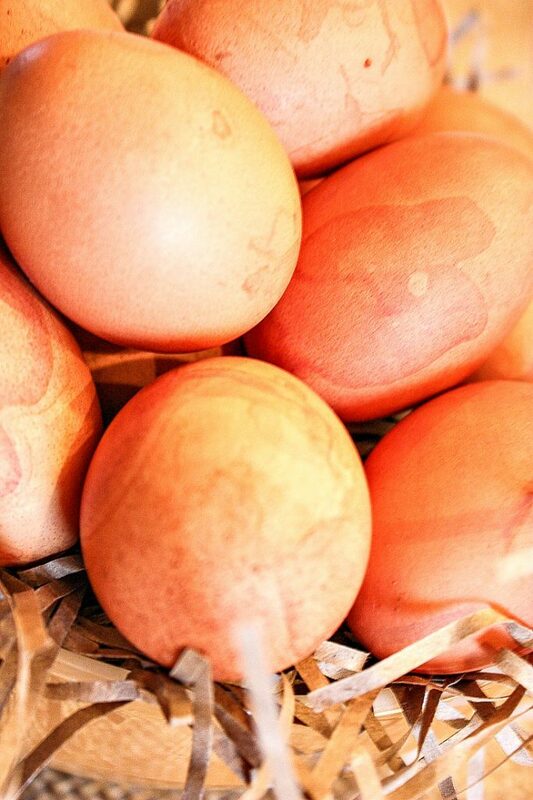 You can see how to DYE ONION SKIN EGGS HERE! I remember my grandmother making these wondeful eggs and she said her mother made them. And we have passed this beautiful way of making Easter eggs down and now my grandbabies will see onion skin dyed eggs on the table Easter morning! I love tradition! It’s the glue that holds family generations together! 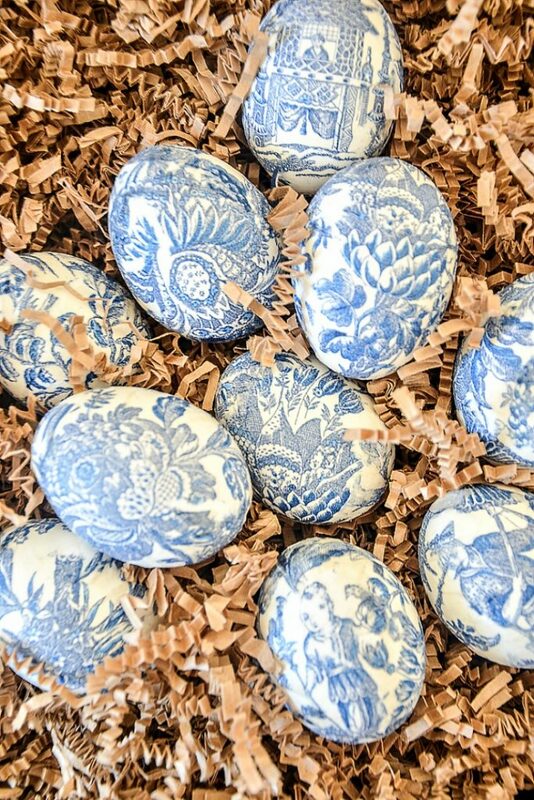 I’m dying these eggs this year and mixing them with the chinoiserie eggs I made! Just sayin’… decorating with orange and blue and white looks GORGEOUS! 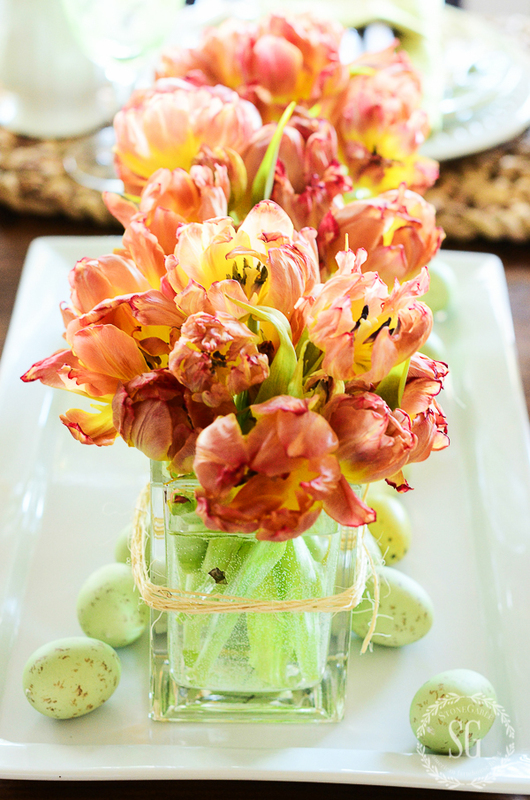 And I’ll be using orange parrot tulips on the table too! If you start now you still have time to make stunning CHINOISERIE EGGS! Think what a beautiful gift a small basket of onion skin dyed Easter eggs would be for someone who is hosting you for Easter dinner. 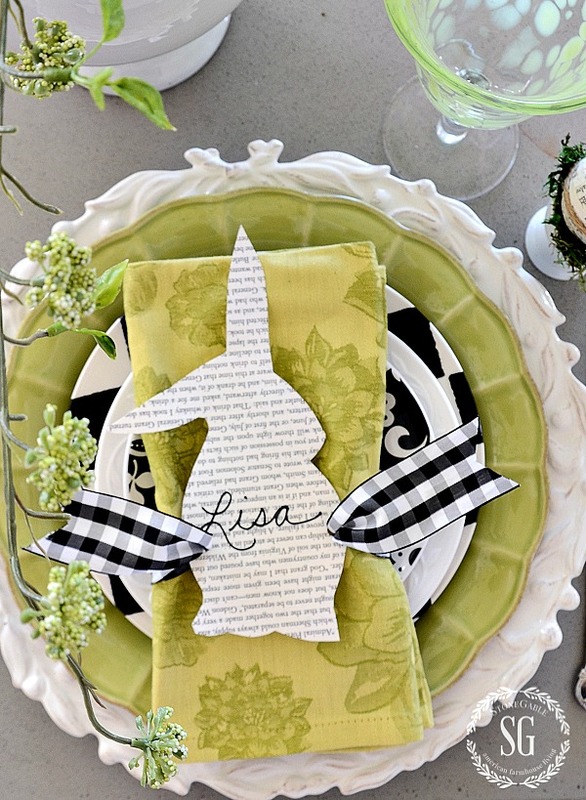 If you are hosting Easter dinner think about adding some interesting place cards to your table! An easy way to decorate your table! These bunny place cards could not be easier! I’ve included a template with my post EASY BUNNY PLACE CARDS. I love the real deal but because I like flowers in my home I often use very good fakes. My room of thumb is… if you can’t see that they are fake from a foot away then they can live at StoneGable! This last minute Easter idea is so so easy!!!! 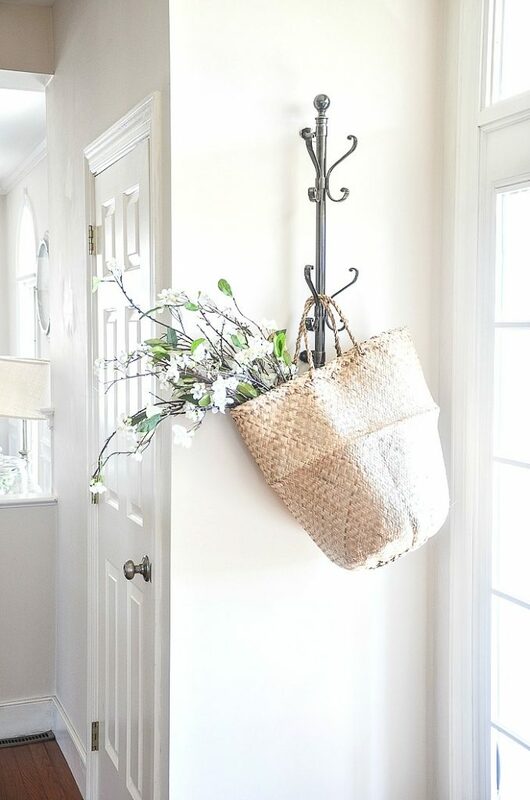 Start now to collect beautiful, realistic faux blooms for every season and soon you will have a collection of almost real flowers to decorate with. Look for them on sale and make the investment. They will pay off for years and years. 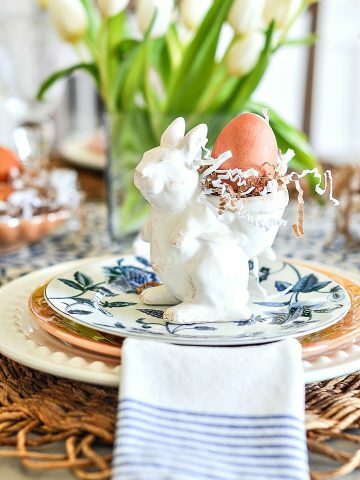 Didn’t you know that one easy last minute Easter idea had to be to create a vignette? After all, I am the self-designated “vignette queen”! 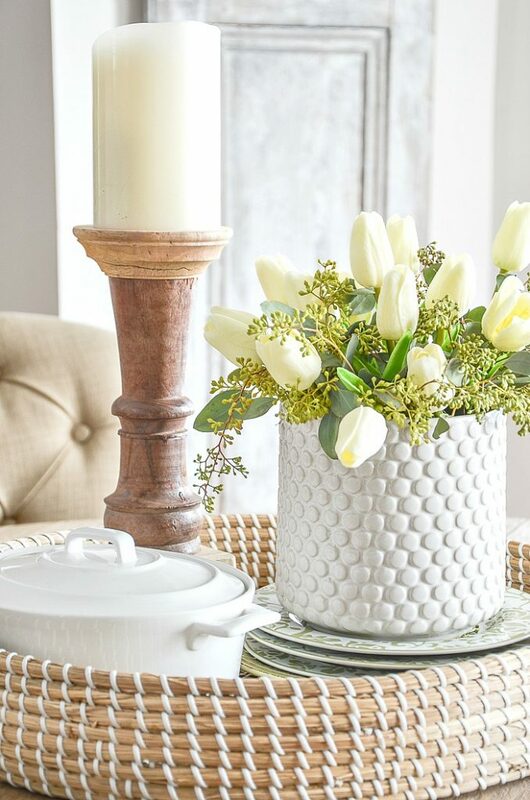 Here’s a non-traditional vignette but it has such a fresh spring feel! How pretty for Easter, right? I made the “hairy” moss balls and put them together with some store bought ones in a natural colored wood bowl. Nothing more is needed! 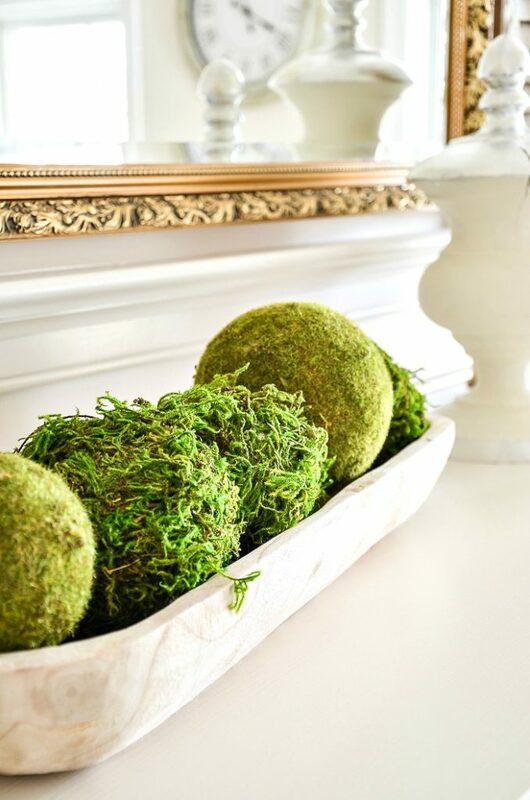 See my TEXTURED MOSS BALL DIY to make these oh, so so easy decor gems! 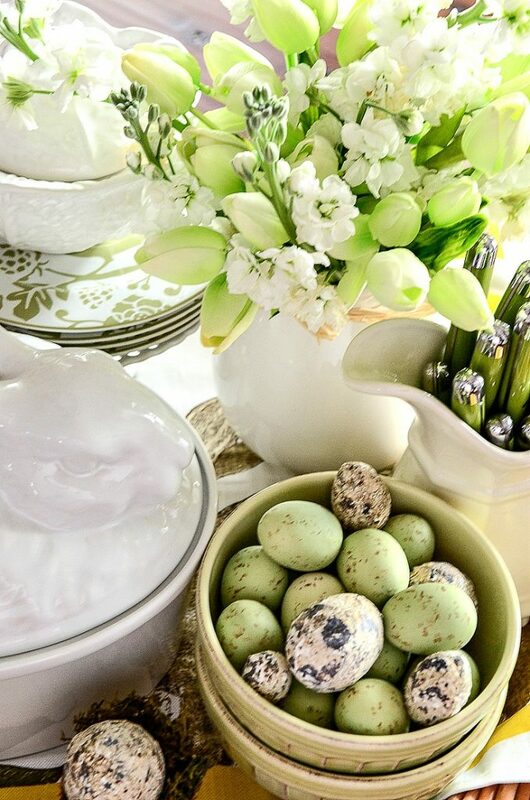 Or how about creating a full-of-the-season vignette for your Easter table. Play with your dishes and create something charming! You can see this SPRING GREEN KITCHEN VIGNETTE HERE. 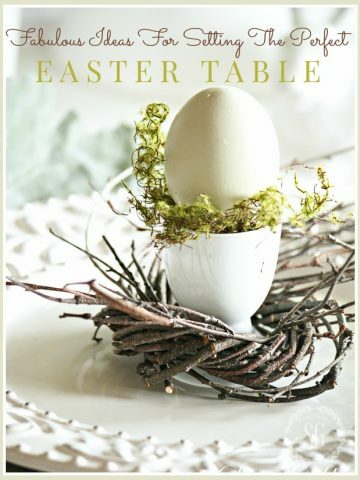 This is such an easy Easter idea because you don’t have to set the whole table! BTW… the tulips are faux and the other blooms are real! A great tip, right? 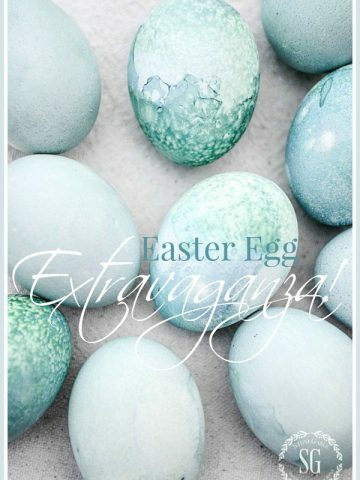 Lastly, I just had to throw this adorable, easy Easter idea into the mix! 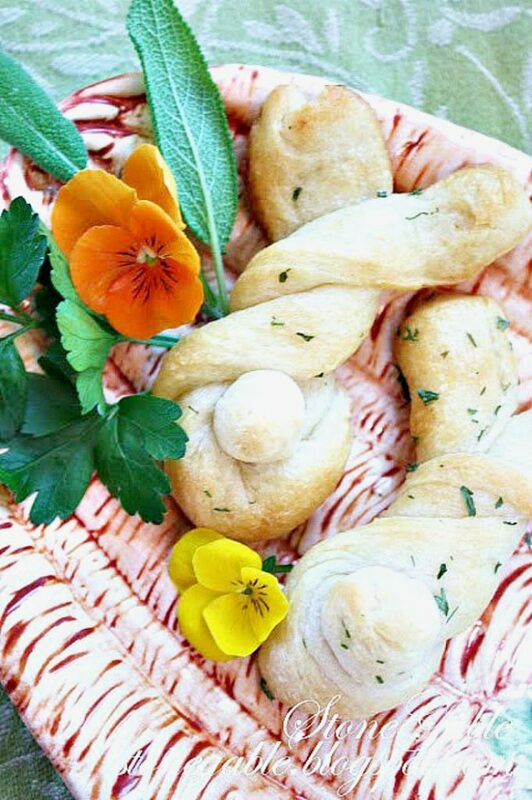 See EASTER BUNNY BREAD FROM A BREADSTICK HERE. Of course, I love ALL your ideas! You are my decor hero! Thanks for linking up at HG, sweet friend! Love all your ideas especially the beautiful tulips.I will have to get some for my Easter table.